Mmmm… vegan crab cakes. So crispy, savory, and satisfying, you won’t even miss the seafood! One thing I really love about eating a plant based diet is that you can really make anything from plants. I’ve even had vegan mock duck that was out of this world! There are many variations of vegan crab cakes, but I love the ones that use hearts of palm as a crab substitute. The texture is spot on and with the Old Bay seasoning, these babies come awfully close to the real thing. Don’t take my word for it, try this vegan crab cake recipe for yourself! Before I became a vegan, I used to loooooooooove crab cakes. They were hands down one of my favorite things to eat, like ever. Now that I am eating an entirely plant-based diet, I have to say, I love these vegan crab cakes even more than the real thing. Eat them as an appetizer, throw them on top of a herbed mixed green salad, or even make a vegan crab cake sandwich. Any way you serve it, this recipe so tasty! Mix all ingredients for the Garlic Dill Tahini Sauce in a small bowl until thoroughly combined. Set aside. In a small dish, combine the ground flax seed with water to make a flax "egg." Stir well and set aside. Heat 2 tablespoons of the grapeseed oil in a skillet over medium high heat. Sauté the hearts of palm for 8-10 minutes, until golden brown on all sides. Transfer the hearts of palm to another bowl to cool. Add the jicama and green pepper. Stir to combine. Heat 1 tablespoon of oil. Sauté the onion for 2 minutes, until soft and translucent, stirring often. Add the garlic and sauté for another minute. Remove from heat and stir into the hearts of palm mixture. Add the flax "egg", ¼ cup of panko breadcrumbs. vegan mayo, cornstarch, and Old Bay seasoning. Mix well and let cool to room temperature, then shape the mixture into 5 large patties. In a shallow bowl, mix ¾ cup panko breadcrumbs with 1 tablespoon Old Bay seasoning. Coat each patty in the breadcrumb mixture, then place them in the fridge to cool for 20 minutes. Heat a large skillet over medium high heat, adding grapeseed oil to a depth of ½ an inch. Carefully place the patties in the skillet and cook until golden brown, about 2-3 minutes on each side. Watch closely to prevent burning. Transfer the vegan crab cakes to a plate lined with a paper towel to absorb any excess oil. 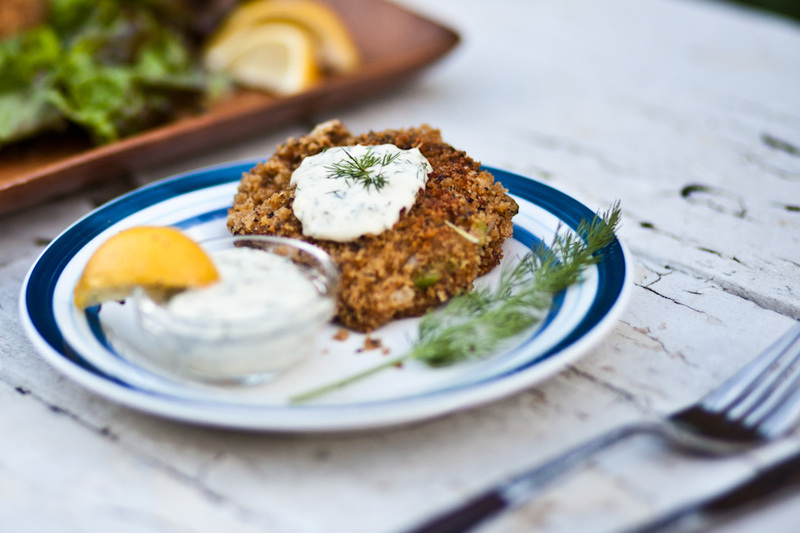 Serve immediately with Garlic Dill Tahini Sauce and lemon wedges. Did you try this vegan crab cake recipe? Show off your stellar food photos on IG! Tag us @carrotsandflowers. We can’t wait to see what you make! For other tasty savory vegan options, try our Green Goddess Parsley Hummus or our Vegan Baked Polenta! To save these Vegan Crab Cakes for later, simply pin the photo below!